While I wouldn’t want a physical keyboard built into iPhone or iPad, I must admit typing on a screen isn’t the most enjoyable experience. The less you need to type the better. That’s where iOS keyboard shortcuts will come in handy. The idea here is that you type a little text and then it expands into a full phrase, sentence, or paragraph. This works out to be a great workflow for text you find yourself typing over and over again. These are just some ideas but the possibilities can be endless based on your personal scenario. In order to create your own shortcuts, on your iPhone or iPad go to Settings -> General -> Keyboard -> Shortcuts. Now tap the + button in the upper right. Then enter the phrase you want to be automatically typed. Next, enter the shortcut you want to trigger that phrase. That’s it. 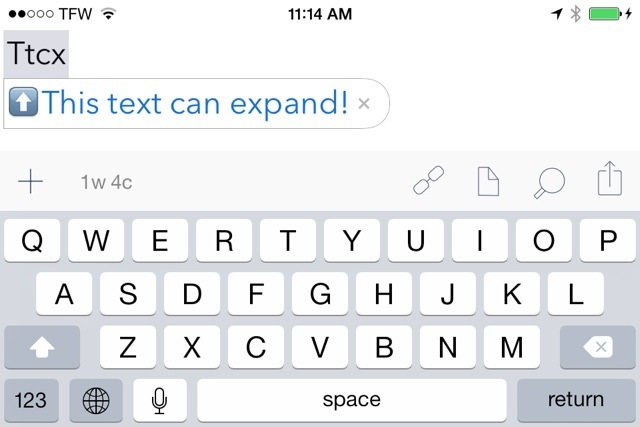 Now anytime you type that shortcut on your device, it will expand into the full phrase. Pretty cool, huh? Additionally, if you use iCloud on all your devices, including Mac, these shortcuts will be synced between them all. Take a look at iOS keyboard shortcuts for yourself and let us know how you use them. Shortcuts are pretty cool. Until Textexpander for iOS gets the access it needs to run across all apps, I’m using this. I totally agree. TextExpander is an amazing app I use all the time! iOS is it’s only limitation.